In Fate of Art in the Age of Terror, Boris Groys notes how the contemporary terrorist/warrior exhausts the media possibilities at hand and produces images—of shock and awe— that have “an uncanny aesthetic similarity with alternative, subversive European and American art and filmmaking of the 60-and 70s.” In particular Groys compares the gory photographs of Abu Ghraib for instance to Viennese Actionism, Pasolini etc. Yet, he notes that although there might be a similar subversive underpinnings to both types of imagery they follow two complete different trajectories: while the modern art tendencies to “be radical, daring, taboobreaking, going beyond all the limitations and borders,” is iconoclastic at large, terrorists in contrary want to produce icons. While the former is concerned with critique of the representational qualities of the image and its relationship to the real, the later in turn desires to show the real and to be taken as representation of the real. Groys opens the article by noting how before the age of mechanical reproduction, the warrior was dependent on the artist to be mounumentalized and for his heroic actions to be narrativized and depicted. But now, the fighter is free from this dependency and has full control over the documentation and dissemination of his actions. Still, these acts of terror, from the most common depictions of atrocities to the most choreographed examples are carried out in battlefields, public urban or rural spaces or terrorist hideouts. As such, while the visual strategies of these actions might share some attributes with the avant-garde, the venues of presentation is essentially different from that of designated space of art. Even public executions, however meticulously planned are—rather strategically—staged in busy public squares and intersections. 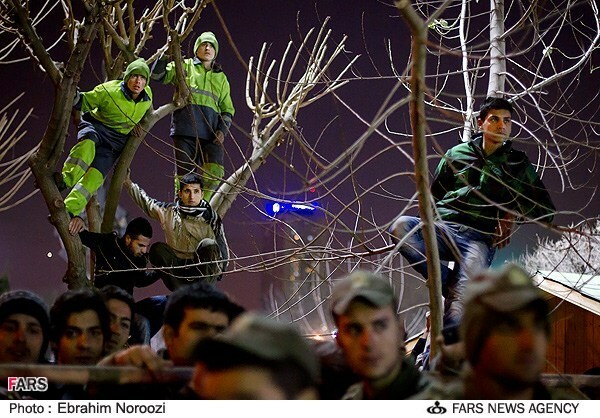 Yet recently on January 20th 2013, a group of “thugs” or “outlaws,” were executed in front of “Khaneh Honarmandan,” (Artist’s House), an arts and cultural center in downtown Tehran with exhibition and performance spaces. It created an uproar in social media spaces and also the news media. 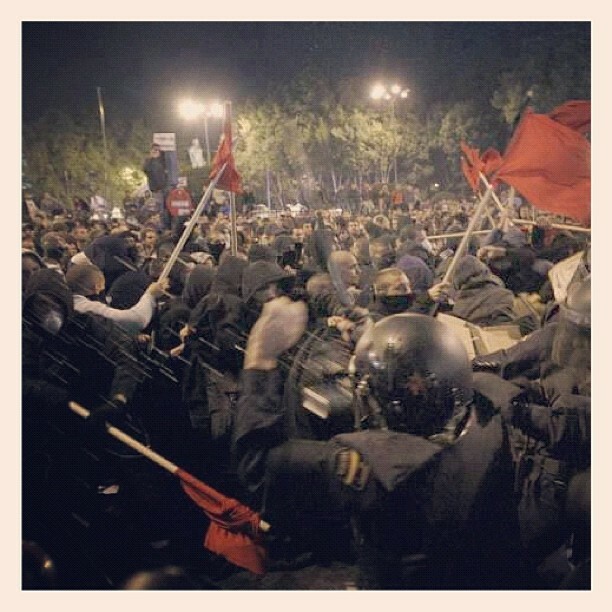 The highly choreographed event was widely documented and photographs of the event from the start to conclusion were distributed over the internet and beyond. To go back to Groy’s analogy, what makes this event significant (not in an ethical and moral point of view, which is obvious and widely discussed on the net) is again this intersection of art and terror or bare power of state in this instance. Here, the exhibition space is appropriated by the state to display its force and as such the state also displays the desire to become art. As such, government and judiciary also become components of the art of the state as performances, exhibitions, and events. If the forces of power, terror and war have the capability to utilize media similar to the artist, they also share the desire to exhibit their aesthetic productions. While of course the spaces of art—for the most part—have far less capacity than mass media, internet, public squares, parks or stadiums, but they do present certain aesthetic and symbolic possibilities that such venues cannot offer. The state as icon finds its last resort in the exhibition space, which nevertheless follows certain ontology and a historical movement as Groys also notes in his essay. By inhabiting the space of art, the state opens itself to critique. Eyal Weizman differentiates between pedagogical violence and total or absolute violence. While the former functions linguistically where in addition to eliminating the intended targets it communicates with the survivors, the latter is exercised to wipe out the subject completely, and/or to produce a new subject—and as such introduce a new language. Yet, the pedagogical violence functions as long as a gap between the actual and possible violence is maintained and thus it is a discursive form that manages this space that it first defines and then opens it for negotiations. The form of violence exercised by the Israeli military in Gaza belongs to the first order of violence but it is to achieve the results of the second order (one can of course imagine any form of pedagogical violence an absolute form if it is exercised systematically in a large-scale to produce new subjects. As for instance penal violence is expected to transform the subject). The total elimination of the subject, in this case the Palestinians, is not solely a military job, but rather it is a media operation that manages and supports the military to achieve its goals. It functions on two separate layers: the image and the voice. The media simultaneously presents and distributes the mute images of Palestinian dead and wounded and the voice of Israeli officials and pundits who frame the invasion as retaliation, a response to a rocket strike by Hamas militants. The Palestinians, the victims of the mortars are revictimized in the image—the mute dead, traumatized or severely injured subject. We see dead Palestinians and hear living Israelis. The words belong to the living and the images to the dead, and as we know the dead cannot talk unless summoned from the underworld. The opposition in Syria is documenting the war from all angles and sides, creating an immense online repository of images of destruction, updated by the hour on the internet. A survey of the images from the start of the uprising in March 2011 to date show the changes in the landscape of violence and its intensification. Thomas Keenan and Eyal Weizman (see Weizman, The Least of All Possible Evils)note about the communicative, or pedagogical dimension of violence, sustained by the gap between the actual destruction inflicted by an army and the possible destruction that an army is able to apply. “It is through the constant demonstration of the existence and size of this gap that the military communicates with the people it fights and occupies,” writes Weizman, “restraint is what allows for the possibility of further escalation.” Now with this in mind, the question is how much the documentary apparatus that is capturing the violence in Syria can define and act as a measure of the aforementioned gap, and whether the production and consumption of the visual material can also develop a capacity for resistance and a threshold for intensification of violence. That is, in each phase of this conflict, the visual material have surpassed what was considered or believed as tolerable, and yet the receivers of the violence have managed to document and distribute the atrocities. It is important to note that unlike many previous contemporary conflicts, it is the receivers of the violence who are also acting as documentarians instead of the professional journalist. Thus an analysis of the visual material can help the military to adjust the forces of destruction according to the degree of tolerance exercised in the act of documentation. But yet, there is another dimension to the war and that is total destruction, and here the gap between possible and actual violence is closed, and war becomes a “total war… stripped from semiotics.” At this level, war is not about conviction of the subjects of violence, but rather about the reconstruction of the desired subject or the total annihilation of the surplus. The visualization of violence, on the one hand creates a public arena that acts as a vessel that communicates the representation of the actual inflicted violence and thus also opens the possibility of further violence by defining a degree of tolerance in production and viewership. The image constantly reconstitutes the subject that the violence attempts to erase. But yet through this dialectical relationship between violence and the image, a different subject is created. This subject is different from one of representational politics where the constitution or existence of the subject is contingent upon its representation. This visualized [undefined] subject is no longer completely the subject that it used to be (before reception of violence), and neither is the new subject that the inflictors of violence intend to construct. This subject is an a-historical one, existing as an image that defines the limits of representation. In artist Mark Leckey’s Pearl Vision, the drum stick penetrates the snare drum’s vent whole, the player’s crouch reflects onto the silver side of the drum, the beats in sync with the music that defines all the movements of the image, an image that is so pristine that only the digital depth of the beats match the density of its pixel rates. In the piece desire, image and reality infuse, the image defies the desired reality, desire is soaked in the high density of the pixels. HD is the retinal critique of the real, it is what the real attains to be. It proclaims that unless you (or the event) have the condition to be represented high-def then your reality will remain limited to the pixels of your phone camera. The lo-fi image is a mere representation without transcendence to the ultra-real. Here the conditions of the image define the reality on display. The pop icon whose drop of sweat sliding down her skin is more water like than the river running down the creek. The commodity that is transcended to the image of the represented commodity, applying living beings to attain to its image, while always countering them with their incapability. The indigenous journalists’ videos interspersed in the newscast showing the atrocities of the army shelling civilian quarters or of a hurricane hitting land, show the immediate real, the poor image, while the newscast’s high-definition is that which reality aspires to be. The pixel rates of the image correspond to the quality of the event, that if only could be produced under certain circumstances posing before the hi-def camera, it could then transcend into the ultra-real. 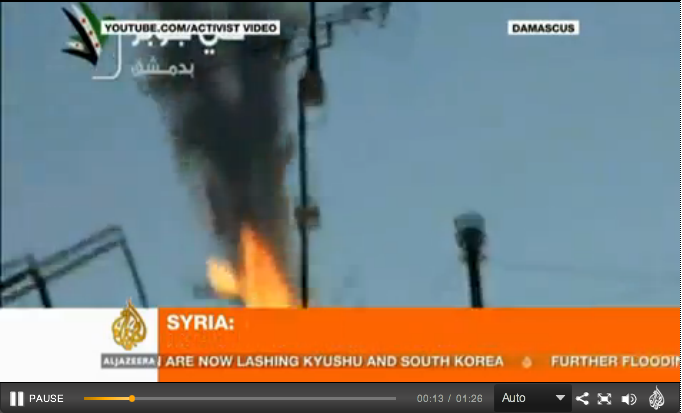 An Al Jazeera English news clip from August 27th, 2012 bearing the headline Syria military helicopter crashes in Damascus reports on the claims of Free Syrian Army shooting down the helicopter. The standard narrative which includes both the rebels and the official sides of the story is heard over images of a burning rotorcraft spiraling down the sky. A text bar that appears on the upper left corner of the footage reads “YOUTUBE.COM/ACTIVIST VIDEO,” i.e. Al Jazeera’s correspondents have not produces the videos. The 1:26 minute clip is a collage of ten indigenous videos shot by civilians or activists and uploaded on youtube. The crash is captured from all sides and angles; long shots from a far, from underneath, a shot from the building right behind which it crashed, long shots of smoke rising over the neighborhood. A collection of footage that is close to the dream of any news broadcast corporation a few years ago as such thorough visual coverage of an event would require ten cameramen on stand-by in ten different locations in the city, a financially and logistically impossible task especially in combat conditions. But this all-encompassing coverage of the event by civilian cameras is not particularly new, and especially not in Syria where the documentation of the conflict was from the outset an integral part of the protest-turned-civil-war. 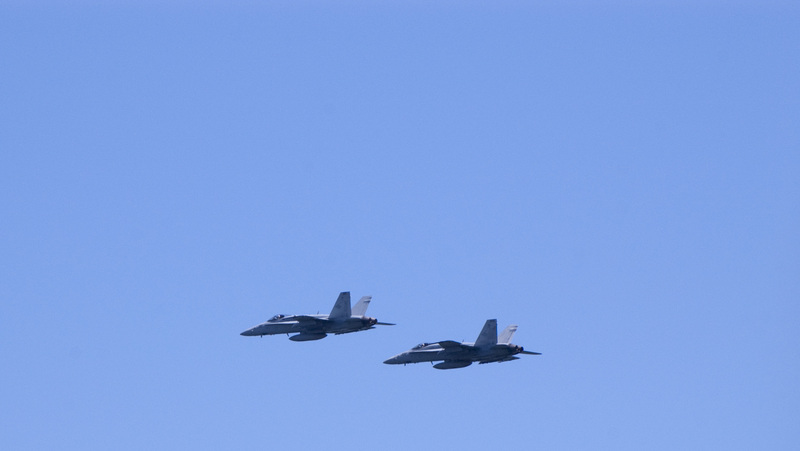 But following the stream of Syrian videos online, one of the recent recurring tropes was videos of aircrafts flying in the sky, usually to document the use of overhead shelling of cities by the regime forces. 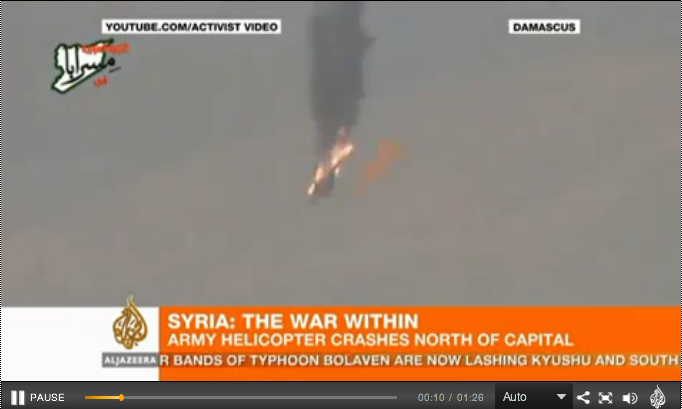 The videos, as discussed before, were for the most part isolated images of helicopters or airplanes flying against the blue sky, and it was only the supporting Arabic voice over that contextualized them within the Syrian conflict and were contingent upon their placement within the larger online archive of the conflict. But the videos signified a shift in attention, an expansion of vision or rather the dimension of the war, which now included the sky. In addition to documentation of the events and evidence on the ground, the videographers now pointed their cameras to flying objects in the sky in anticipation. 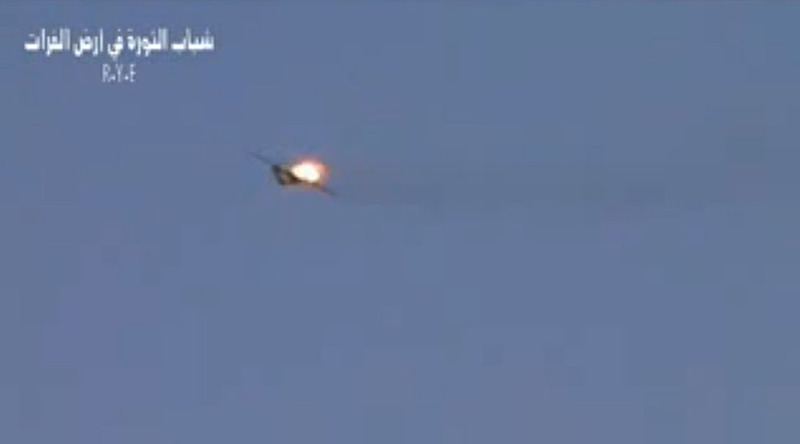 The direction of the camera lenses preceded the event and captured the imminent falling of the aircraft before being shot down by the FSA artillery. 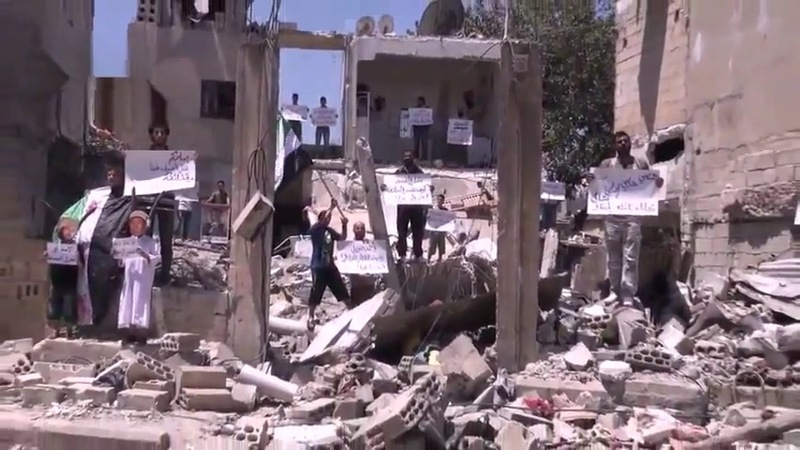 The video Over Rubble, The Brave Continue to Stand for Freedom, appeared on the SyrianDaysOfRage youtube feed on August 3, 2012. The video differs from most of the clips from the Syrian available online. It does not have a solely evidential function, as it is not a direct documentation of the Syrian Army’s atrocities, shelling of cities, piles of mutilated and dismembered torsos, etc; it is not a call for attention as in the videos of victims describing what went on during an attack as in a news reportage; it is not of army defectors or formation of battalions declaring their position to the internet; not a documentation of direct confrontation between the Free Syrian Army and the regime; not Assad forces “leaked” videos. This video is of a group of civilians (or they appear to be) staging a performance over rubble from a recent shelling in Talbiseh near the city of Holms. Holding placards with slogans and information, the group chants La Ilaha Illa Allah, and Assad is God’s enemy. The person on the top right in what appears to be the kitchen holds a sign that reads “home of martyr Jalal aldin Latoof,” thus we know that the performance is taking place over what once used to be his house. Others signs are either asking for God’s mercy, or include messages to Assad. In the middle of the image someone is waving the Free Syrian flag. In the group of four on the left one is holding a sign, another a flag and the two children are each holding a smaller placard. Upon closer scrutiny it becomes clear that the two children are wearing masks. The video at once shows the destruction of the city, it includes information about its location, but also by turning the site of destruction into a stage it implies a consciousness with regards to the spectacle of the war and directly addresses it. It shows that not only the rebels are using the media to disseminate information and as a documentary tool, but are also aware of the medium and its possibilities and complexities. The video is showing not the dead, but the survivors, it commemorates the dead, but does not turn them into evidentiary material, it acknowledges their presence, or rather absence, but not by victimizing them through the image. The technique is not dissimilar to the songs in epic theater, while the larger narrative that it is inserted in is the visual online database of the conflict. It is made to go on the flow of clips and appear on the side bar, and momentarily disrupt the stream of violence, while not discarding it by way of complete distraction.